Hello my friends! I'm coming to you from a wonderfully sunny and warm'ish Midwest slice of heaven. The temps have FINALLY warmed up some but are still a little on the inconsistent side. 75 one day and 62 the next. But it's better than a foot of snow! And while I'm thinking of it - Happy Memorial Day to all the veterans and their family and friends. Thank you for all you do for us! 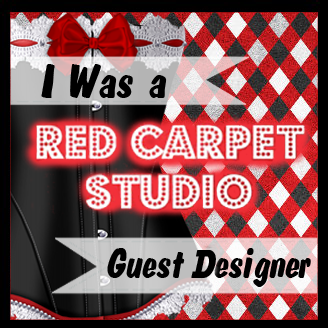 Well, it's time for another challenge at The Paper Nest Dolls. This 'Anything Goes' challenge starts Monday, 5/26 and ends Friday 6/6. Today I'm using a new image (available in rubber) and her name is 'Dutch Girl Avery'. I'm a sucker for flowers and who doesn't love tulips! And I've colored the tulips in a two-tone pink and yellow combination. Very easy to do and such a wonderful look. I colored her with my COPIC markers and used quite a few of them. The dotted background is a colored vellum from Doodlebug which I love. I ordered just about every color they make. The flower embellishments are cut from the same vellum with the Die-namics 'Layered Rose' die. Here's a close up of Avery all colored up!! Now for some housekeeping - We're offering to one grand prize winner (randomly selected) a $20 online gift certificate for the Top pick when a Paper Nest Dolls image is used in their entry. One free digital image each for the Top 3 randomly selected entries (not required to use a Paper Nest Dolls image) will be given as well. 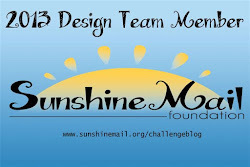 Winners will be announced on the challenge blog on Su, day 6/8. Remember you have until 6/6 to enter your creations on the Paper Nest Challenge Blog HERE. I can't wait to see what you create! Hello my friends! 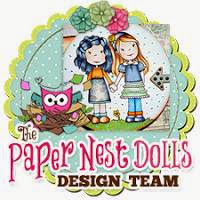 It's time for another challenge at The Paper Nest Dolls. This 'Anything Goes' challenge starts 5/12/14 and ends 5/23/14. Today I'm using a new image (available in rubber) and her name is 'Sunflower Ellie'. I just love sunflowers and I think she looks adorable in her little overalls. This time I switched it up a bit and she's colored with my Prismacolor pencils and Gamsol. I've been coloring everything lately with my Copic markers that it was nice to use another medium. Maybe next time I'll use my Inktense watercolor pencils and see what happens, It's great to have choices! We're offering to one grand prize winner (randomly selected) a $20 online gift certificate for the Top pick when a Paper Nest Dolls image is used in their entry. One free digital image each for the Top 3 randomly selected entries (not required to use a Paper Nest Dolls image) will be given as well. Winners will be announced on the challenge blog on 5/25/14. Remember you have until 5/23/14 to enter your creations on the Paper Nest Challenge Blog HERE. I can't wait to see what you create!